In My Mailbox is a meme hosted by Kristi of The Story Siren and was inspired by Alea of Pop Culture Junkie. This meme is about books that you received or bought during the week. Well, well. To be completely honest, I've totally spaced doing an IMM post the past couple of weeks and so as a result, this one is going to be rather large. Things have been a little quiet around here of late thanks in part to some traveling, sickness, and a general mood of I'd-much-rather-read-than-write. Understandable, no? But hopefully I'm back on the wagon -- I've got a couple of fun things lined up for this week. 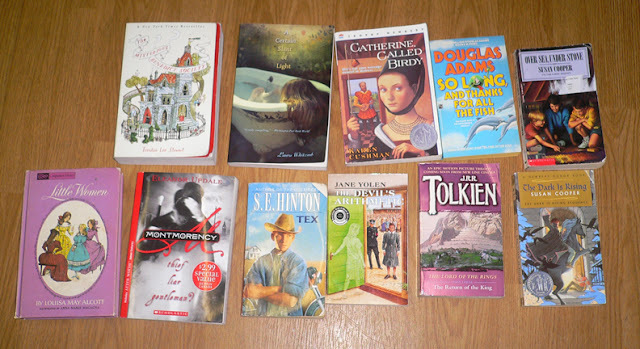 A few weeks ago, my library hosted a friends of library sale (love, love) and I scored pretty big. Most of these I've already read but are still YA classics and thus ones that I want floating around my house. I am especially excited about this vintage copy of Little Women I found - it's one of my all-time favorites. I particularly love the awesome illustrations. 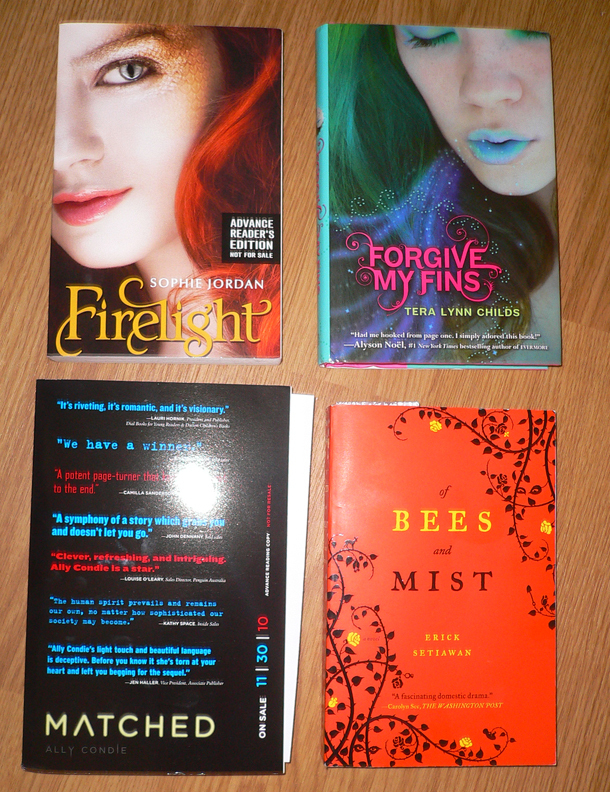 I also got a couple of books for review and even won two books from Tera Lynn Childs blog: a signed copy of Forgive My Fins and Firelight - both of which I am very excited to read. So that's everything -- quite a haul to be sure. It's gonna take me some time to make a dent in these I'm sure. Now tell me, what did you get this week? i love second hand book sales so much! and you got a great stash - such a great feeling. i keep thinking about reading Firelight even though it's not in my fave genre - have heard so much coo stuff about it. Whoa, you got so many books! Library sales are amazing. I can't wait for you to read A Certain Slant of Light because it's a lovely book. :) That edition of Little Women that you got has some beautiful illustrations. Hope you enjoy reading Firelight even though I didn't really like it. I'm looking forward to seeing what you think of Forgive My Fins and Matched. Nomes - That is my feeling exactly. And yes, I'm really looking forward to FIRELIGHT, hopefully I'll enjoy it. Chachic- I am so in love with that LITTLE WOMEN book. And yes to the other two. I'm very intrigued by the concept of all three.